How Do I Use a Golf Divot Tool? Proper use of golf divot repair tools help greens stay in good shape and putts to role truer. Golfers must properly repair ball marks from golf balls that land on the green. Golfers use the golf divot tool to repair these marks. However, if used incorrectly the tool can result in additional damage to the green. USGA golf etiquette recommendations state that players should take care to repair all divot holes made by their ball or cleats to the putting green at the conclusion of play on the hole. Players should also attempt to repair additional ball marks on the green to preserve the condition of the golf course. Insert the divot repair tool in the putting surface just outside of the edge of the ball mark at about a 45-degree angle. Press down and then forward on the repair tool in order to help press the putting surface turf closer in a direction toward the center of the hole. 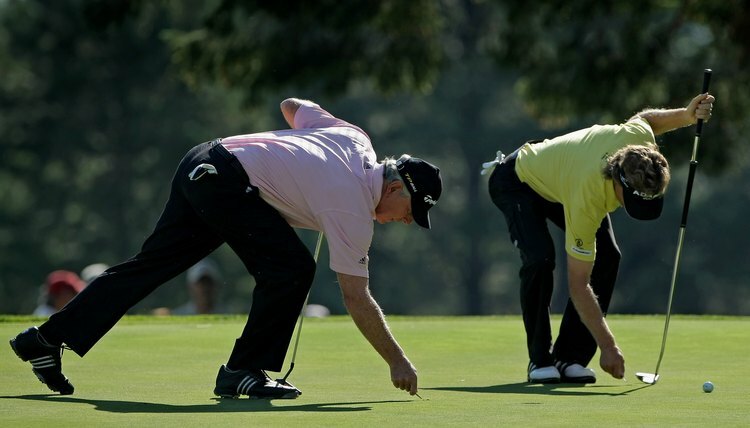 Take care not to push up on the ground at the bottom of the ball mark, or damage to the putting surface may occur. Move the ball repair tool to the side to help close the ball mark. Repeat the process until the mark is completely covered by turf by pushing the sides of the mark or divot together. Tap down on the affected area of the green with a putter to complete the repair. Ensure you tap the green lightly, as soft greens could be further damaged by this step if you use too much force. Report any severely damaged greens from ball marks and divots not repaired by other golfers to the pro shop at the turn or conclusion of your golf round. Leaderboard: What is a Divot Tool? Sports Comet: How Do You Use the Divot Repair Tool?